Professor and Spokesperson of Competence Area "Social Inequalities and Intercultural Education" (SINTER), within the University of Cologne's Institutional Strategy, German Excellence Initiative. The professorship in Early Childhood Education primarily focuses on children from 0 to 12 years of age and the learning processes they engage in within different educational contexts, particularly within families, daycare institutions and school classes, and in different educational systems. The critical transition periods - from family into daycare and from daycare into school - are examined in depth and by way of comparison, for these transitions highlight the diversity of children's educational backgrounds as well as the conditions of the different educational institutions involved. Another important focus is placed on the language development and language education of mono- and multilingual children in heterogeneous (learning) groups in early childhood and educational institutions. Additionally, related themes such as heterogeneity, migration, inclusion, and intercultural education, are also addressed. Qualitative educational research, ethnographic approaches in Germany and other European countries in particular, play a central role here, for our guiding interests are oriented toward the analyses of actual practices engaged in on site, in all their complexity and informed by participants' perspectives. Only through the implementation of such research approaches can insights be gained into the developmental and educational processes children undergo, the experiences they have in their daily lives and in the context of educational institutions specifically, the practices they develop, and the support options they draw on. Such conditions are ascertained and subsequently reflected upon not only within the contexts within which they arise, but also in relation to educational theories and policies. Social inequalities are created in educational systems along lines of difference such as ethnicity and linguistic diversity. Minority and immigrant students are particularly affected by such inequalities. Thus far, we have investigated educators' attitudes in monolingual vs. multilingual educational systems. The central question of this study hasbeen: How are school experiences and attitudes about linguistic heterogeneity and heteroglossic practices interrelated in monolingual educational systems, such as in Germany and Greece, and in multilingual educational systems such as in Quebec, Canada? To date, we have conducted expert interviews of (multilingual) teachers and early childhood professionals at the German School in Thessaloniki (February-April 2013), the German School in Montreal (April 2014), Complementary Greek Schools in Montreal (April 2014) and the German School in Athens (October 2014). New migration movements give rise to new challenges for migration societies, especially for democratically constituted educational systems. For this project, we are particularly interested in the experiences of families who left Greece after 2008 in the wake of the financial crisis and emigrated to Germany or Canada. We have already conducted several biographical-narrative interviews with families in Quebec, Canada and North Rhine-Westphalia, Germany, i.e. we have interviewed parents and their school-aged children. Initial results of our analyses indicate that this phenomenon not only has a historic dimension, but is also “new” insofar that it is distinct from the European labour migration of the 1960s with respect to migrants’ goals and motives as well as their social and socio-economic backgrounds. Additionally, it has become evident that those parents who were part of the (upper) middle class in Greece were less concerned with issues of “social mobility” and had primarily been motivated to (re-)create “stability” through the education of their children in Germany and Canada. Our question is: From the perspectives of immigrant parents, children, and youth, how do the educational systems of these classic immigration societies (Canada and Germany) approach this shared and onceagain highly relevant challenge to create “educational equality for all”? The project EFIS NRW - On the Path toward Inclusion: Ethnographic field studies in schools in NRW was initiated in the fall of 2013. This ethnographic research project follows educational professionals and students in primary and secondary schools in NRW over the course of two years (2013-2015). The objective of this research is to identify the critical issues and the current challenges associated with the educational policy of "inclusion" and its application in educational settings. The daily practices and their interpretations as reported by the subjects themselves are of particular interest. Professor Petra Herzmann and Research Assistant Thorsten Merl of the Department of General Didactics and School Research and Professor Argyro Panagiotopoulou, Professor Lisa Rosen and Research Assistant Julia Winter and Jenna Strzykala at the Institute of Comparative Education Research and Social Sciences. The research project focuses on the experiences of "Black Germans" in education as well as their experiences of difference. The research interest is to study if and how Black Germans have experienced differences within the institutions of the educational system, what (social) categories of differences they experienced as meaningful and what relevance these experiences have for their individual biographies. Previous work concerning the situation of "Black Germans" indicate a historical continuity both in terms of specific racist attitudes towards black people and in relation to the construction of "being-German" as "being-white" (Pokos 2009). In addition, existing studies demonstrate that the institutions of the German education system often are the places where "Black German" children are confronted with their supposed (ethnic) difference for the first time (Kampmann 1994; Diehm / Kuhn 2006; Madubuko 2011). The research project is being conducted in cooperation with the research project "Children of Occupation (Besatzungskinder)in post-war Germany - Experiences of Education and Difference." A contextual proximity between the two research projects becomes evident in recent publications in educational sciences concerning the education policy debates about the integration of so called black "Besatzungskinder" during the 1950s and 1960s (Schröder 2009). In addition, "Black Germans" who are called "Besatzungskinder" can be considered as a specific generation of "Black Germans" (Ayim 1997). CoLiBiis an international collaborative research project investigating how different forms of bilingual education are associated with cognitive andlinguistic proficiency and practice in children being raised as German-Greek bilinguals. This study, involving the gathering of data in both Greece and Germany, places particular focus on the interaction between general linguistic and literacy competences and practices. The interdisciplinary orientation of this project is intended to facilitate adifferentiated look at the complex interaction between psycholinguistic, social, and educational aspects. Professor Ianthi Tsimpli and her team at the Department of Theoretical and Applied Linguistics at Aristotle University. Argyro Panagiotopoulou,Professor of Early Childhood Education and Qualitative Educational Research, and her team at the Faculty of Human Sciences and Christiane Bongartz, Professorof English Linguistics and Second Language Acquisition Research, and her team at the Faculty of Arts and Humanities at the University of Cologne. (c) their correlation with the development of general linguistic and literacy competences and practices. (4) the treatment of bilingualism and literacy in families. This innovative combination of psycholinguistic, sociolinguistic, and educational research approaches allows us to provide a comprehensive overview of linguistic and cognitive abilities and their interactions. Researching relevant educational contexts also makes it possible to evaluate existing bilingual educational concepts and to propose suggestions for improvement. Project team meetings and research visits abroad are funded through the bilateral IKYDA Program of the German Academic Exchange Service (DAAD) and the Foundation of the Greek Ministry for Education (IKY). The Learning through Research project gives teachers in training the opportunity to familiarize themselves with academic research. Innovative teaching methods are utilized, facilitating the possibility for independent work. A research cohort (25 members) is the central focus of this project, and these students are provided with insights into research practices from planning to execution to analysis and evaluation. Special attention is paid to testing practical research methods (e.g. ethnography, video recordings of lessons) as applicable to relevant issues (e.g. inclusion). Members of this research cohort are then expected to contribute expertise and experience gained through their own research by participating in the development of the IUS (Inclusive University School). As Learning through Research project staff, Professor Argyro Panagiotopoulou, Professor Lisa Rosen and Research Assistant Matthias Wagnerwill jointly be offering the seminar "Research Workshop: Ethnographic Educational Research" as the ethnography component of Module 1 (ResearchMethods). Since 2006, the comparative ethnographic research project HeLiE (Heterogeneity and Literacy in the Transition from Early Childhood to Primary Education in EuropeanComparison) has been implemented in pre-primary and primary educational institutions in different European educational systems. This project is centered on the transition to formal schooling. The focus is on understanding how migration-related heterogeneity and literacy and linguistic support are addressed in early childhood and primary educational institutions in diverse European educational systems, whether integrative or selective, monolingual or multilingual. In addition to examining the structural and curricular conditions of the relevant educational systems, the practices and support strategies of educators and the specific literacy and linguistic practices of (multilingual) pre-primary and primary school children are also investigated. The doctoral students who participated in this project and conducted a series of ethnographic field studies focussing on children from socio-economically disadvantaged immigrant families transitioning from pre-primary to primary education are: Nadine Christmann (Luxembourg and Germany/Rhineland-Palatinate), Kerstin Graf (Germany/Rhineland-Palatinate and Austria), and Wiebke Hortsch (Finland and Germany/Rhineland-Palatinate). In cooperation with Professor Eleni Skourtou (University of the Aegean, Rhodes, Greece) and Panagiota Trikou (doctoral student), ethnographic field studies have been conducted at Greek educational institutions since February 2010. Since 2011, the Memos Project (see below) (School of Education, University of Applied Sciences and Arts of Northwestern Switzerland) has been implemented as a follow-up project in German-speaking Switzerland. To date, the following publications and presentations have resulted from the HeLiE project. In cooperation with Professor Maria Roggenbau-Engelen,Department of Socialization Processes and Interculturalism at the University of Applied Sciences and Arts of Northwestern Switzerland (FHNW), the MEMOS project was conducted from 2011 to 2013. (2) the conceptual development of inclusive language support, taking into consideration the conditions, objectives and existing realities of child care institutions, with such language support to be integrated into daily life at these institutions and to be evaluated jointly with participating caregivers. 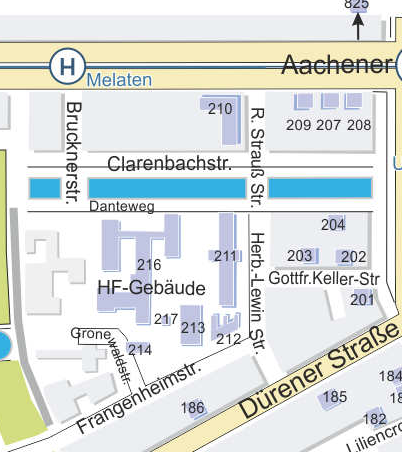 By train: Take line 1 or 7 to "Melaten" station, then continue on Brucknerstr., turn left onto Danteweg (following the canal). From there, you can enter the HF-Building.